Slip into this new double depth Drew Milan women's sandal and your feet will thank you. With Two Velcro brand adjustable straps, removable cork footbed with memory foam and steel shank, the Drew Milan is our most innovative sandal yet. Great Euro styling and full leather linings provide the sophisticated look you desire while a Velcro brand fastened footbed ensures proper foot placement. Click to see all the Drew Milan colors. Very good, supportive and comfortable. Only one that will work now with my diabetic foot problems--thank you. Advantages: 4E or extra wide width. Velcro works well to adjust too. I would have preferred black but these are functional and comfortable shoes. Wearing 11.5N, I don't find too many shoes that fit me well. 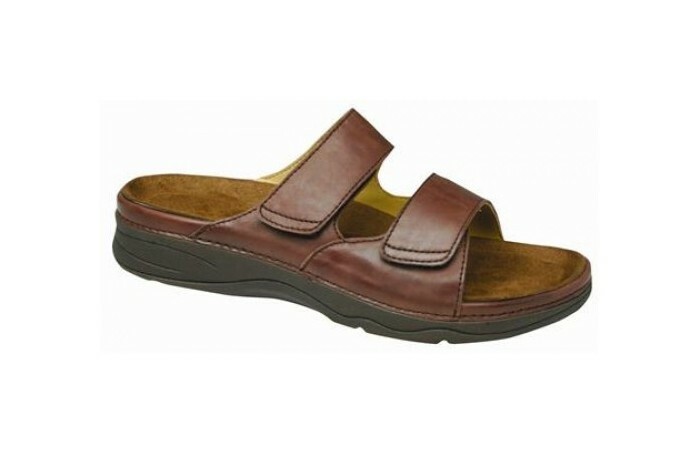 Advantages: Easily adjustable straps, comfortable foot bed, good nonslip sole, nice basic style. Disadvantages: I got these to wear around the house as I have plantar plate insufficiencies and shouldn't go barefoot. They're great for that, but I don't think they'd be so comfortable to walk any distance outside: I'd get sandals like this but with a strap that goes around the heel.